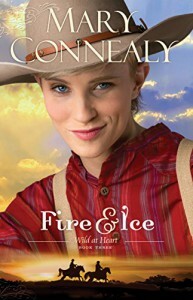 I absolutely adored the first two books in Mary Connealy’s Wild at Heart trilogy, and was anxiously looking forward to the third. Fire & Ice, which features the oldest of the Wilde sisters, definitely did not disappoint. The first two books were heavy on action and quite humorous. While we again have an unknown threat as well as plenty of action and humor in Fire & Ice, it did have a more sedate feel to it. I think of Tried and True as a rom-com, Now & Forever as an action movie with romance, and Fire & Ice as a western drama with humor, though none of these descriptions fully encompass what these novels are. At its heart, Fire & Ice is the story of two people who were damaged by war and by family who turn to God and slowly learn to turn to each other in their difficulties. So, I do recommend this book to anyone who enjoys historical romance, inspirational fiction, and a story that is amusing, exciting and heartwarming. I also recommend reading the three books in order for maximum enjoyment. I received a free review copy through the Bethany House Blogger Review Program, in exchange for an honest review.